Just as online shopping has transformed U.S. retail sales, the Internet has also remade the newspaper industry, but in a manner less obvious to most people. The old print newspaper business and revenue model has been seriously broken by young upstarts—young both in age and in technology. In Merchants of Truth: The Business of News and the Fight for Facts, Jill Abramson, a former senior editorial executive at both The New York Times and The Wall Street Journal, has provided an insider account of an industry fighting for its life. She examines four competitors—the traditional New York Times and Washington Post, and two digital upstarts—BuzzFeed and Vice. The generational gap among readers of the traditional papers and the upstarts is astounding. The median age of subscribers to the Times or Post is over 60 years old. Whereas, people under 35 get most of their news online. The old system relied heavily on an extensive world-wide staff gathering and reporting stories. The new news organizations like BuzzFeed rely heavily on a small staff gathering online information from various sources, mainly Facebook postings, that then is consolidated, edited, and reposted. What is news is no longer determined top-down by an authority like Walter Cronkite or The New York Times. On the Web, the audience establishes its own priority. The readers become the publishers. Or, more sarcastically, the inmates are running the asylum. The traditional newspaper model was broken both on the content side as well as the business side, and newspapers were very slow to see it coming. New York Times editors clung to the notion that their new website would merely be a superficial resemblance of their existing print paper. But news and opinion sites like the Huffington Post and Drudge Report were already siphoning off its reporting, digital advertising, and audience. Other websites were destroying the traditional newspapers’ classified ads, which had accounted for millions of dollars of revenue. Craigslist lured away “for sale” ads, and Monster.com or Jobs.com grabbed the “help wanted ads.” Travel and auto ads were hammered by Expedia and Autotrader. Local ad revenue also declined as local department stores and businesses closed, due to online shopping. 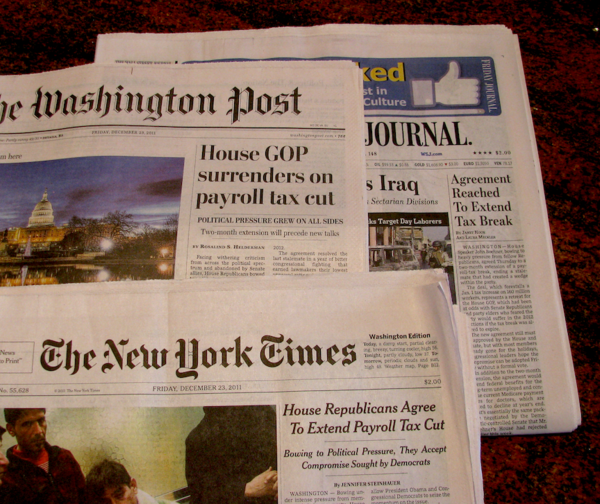 The Washington Post was especially hard hit because classified ads made up 40% of its revenue. Additionally, local papers supported by The New York Times and The Washington Post have been either gutted or closed, depriving many rural and suburban readers of local information, like high school sports. As profits declined, both papers began extensive cost cutting. The stock price for The Washington Post fell from about $1000/share to under $400/share. It needed a huge cash infusion to avoid going bankrupt. The Graham family proposed selling to Amazon founder and Chairman, Jeff Bezos, based on his Internet expertise. Bezos had three essential questions: 1) Was the Post still an important institution? 2) Could he be optimistic about its future? And 3) Did he have the technical knowledge to reverse the paper’s downward spiral? He finally concluded yes to all three. Katherine Graham came back with a $250 million proposal and Bezos accepted. Fortunately for Bezos, shortly after the purchase the paper broke the Snowden/NSA story. This gave a short-term boost in readership, but also answered the first of Bezos’s questions: the paper was still relevant. In the near term, both The Washington Post and The New York Times seem to have survived the ferocious waters of the digital revolution. Before Trump, but especially after Trump, both papers moved further to the left in both their editorial positions and their news reporting. They are regularly attacked by the President as “failing” purveyors of “fake news,” with minimal impact on their readership. They have revised their websites to include more news updates and videos. They are still relevant, but need to explore additional revenue streams to maintain financial stability. Most important they need to worry about their aging demographic. Question: Where do you get your news from? Jerry Levine is a former chemical engineer, political expert, and frequent contributor to the Today’s Machining World website. Check out our interview with Jerry on Swarfcast Episode 18: Jerry Levine on Why Global Warming is Not a Problem. on-line all the time. Paid subscription (by the company) to things like WSJ and The Economist (yes, I read it on my mobile). I stopped subscribing to a hard copy of my local paper about 20 years ago. That was at the same time I got rid of the land line phone and cable. Had to find ways to reduce family expenses. forgot to mention. NPR on the commute. Today’s Maching World, doesn’t everyone? I can almost trust to get my sports score information from CNN, even then I would have to double check those facts! Never from The Washington Post, The New York Times, Buzz Feed or Vice. It is very difficult to find and rely on a consistent legitimate journalist these days. Most are thinly disguised political pundits with a skill set skewed more toward the imagination than the simply reporting of the facts. Today’s audience is apparently willing to pay more for the “news” they want to hear rather than the news that is. Channel 9 Chicago, Skilling has the most accurate weather. The rest requires a grain of salt. WSJ seems to be the best for business news, worth paying for. Reuters daily feeds have occasional articles worth opening and reading the rest of. Nothing from CNN, there seems to be no truth at all, just Democratic spin. A little from Crain’s, but the spin is quite strong there as well. You know it happened, but it is never quite what really happened, and they try to influence elections. Yahoo for the comments after the story. There hasn’t been a fact in any story I can think of, but the comments are hilarious. Modern Machine Shop, Cadalyst, Food Processing, Packaging, Plant Engineer, and quite a few other trade magazines give me news relevant to what I spend my days doing. No spin, just the facts. I like Todays Swarf. Lloyd hits some tough topics, sometimes not machine related, but interesting and even worth throwing a comment. Haven’t had time for a podcast yet, but some day when I get caught up. Should have had them before the Trump era, there was a lot more free time then. Recently cancelled my subscription to NY Times but they send it anyway. It generally nauseates me. Wall Street Journal is still remarkably good, maybe better since Murdoch bought it. Chicago Tribune for Sports. Bloomberg for financial. Cubs Den blog for Cubs news, especially Minor League players. I am an information sucker. When I need specialized info I call the people who I trust to know stuff and who will talk to me. Usually if I ask a straightforward question people will give me a frank answer if I pause to listen—which I do. Podcasts from Marketplace and others on the way to/from work. I real live Chicago Tribune you can hold in your hand at home. For some reason we (I) tend to forget that all news outlets rely on funding to come from somewhere or someone. Network / cable news relies on funding from advertisers. In order to get more advertisers you need to demonstrate that you have large numbers of viewers. In order to get viewers they do what they have to to create a felt need for people to tune in ALL the time to get “urgent” updates & “breaking news”. CNN has created an audience target and they slant their coverage to appeal to their base. Fox does the exact same thing. Every story reads differently depending on what side of it you stand. Personally I take a look at a lot of sources (CNN & Fox included) and do my best to make up my own mind depending on the information I can get. Anyone that thinks they can get unbiased truth from any source is sadly mistaken. The part we seem to miss is we need to try to understand where the people we disagree with are coming from as well, rather than just write them off as “stupid” so we can ignore them and continue on in our little bubble of our own intellectual superiority. This is a sore spot with me. I do not like the growing divide in our country combined with our increasing reluctance to have a real conversation (that also involves listening) to the people we disagree with. For some reason we think posting messages (like this one) is a valid alternative to having a real discussion. NPR Morning Edition, the Daily Show, Front Page of Wall Street Journal that is sitting in the office, and my dad, of course. Most news is too depressing so I try not to pay much attention. Too much distraction. Oh, and for sports the Chicago Trib and Bulls.com. No news feed on the phone! NO FB! NO TWITTER! NO INSTA! Those are only for shameless self-promotion and occasional entertainment. Not much time to read or watch, too busy working to pay my taxes. I enjoy talk radio, every now and then I try NPR radio, but all they talk about is Trump/Russia Collusion when they are not interviewing AOC about eliminating ALL Aircraft/Air transportation and cow farts. Why do I love The Wall Street Journal so much. Writers like Holman Jenkins, Peggy Noonan and Ben Cohen on sports. And then there are the features like today’s on the folks who sell “old mice” raised in Bar Harbor, Maine that are living almost 5 years now, the equivalent of 150 human years. Read the piece, you will love it, too. WSJ six days tmw, no Twitter no Facebook no Snapchat no instagram. The Buffalo News online due to a free subscription. Too far to the left.